Moog signal processors "We make sound effective" full page black and white advertisement, including the Moog 12 Stage Phaser, Moog Three Band Parametric Equalizer, Moog Ten Band Graphic Equalizer and Moog 16 Channel Vocoder from page 35 in the March 1979 issue of Contemporary Keyboard. 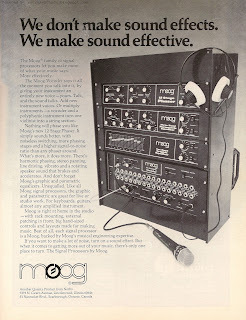 Whenever I first glance at this ad, my mind automatically giggles at the thought of Moog manufacturing a karaoke unit.Come on... tell me that didn't cross your mind when you first saw it. But then my eyes are automatically drawn to that Moog vocoder. And there is absolutely nothing funny about that gorgeous looking beast. Unless you are using it to tell your neighbour's kids to get off your lawn in a robot voice. Then it's definitely funny. 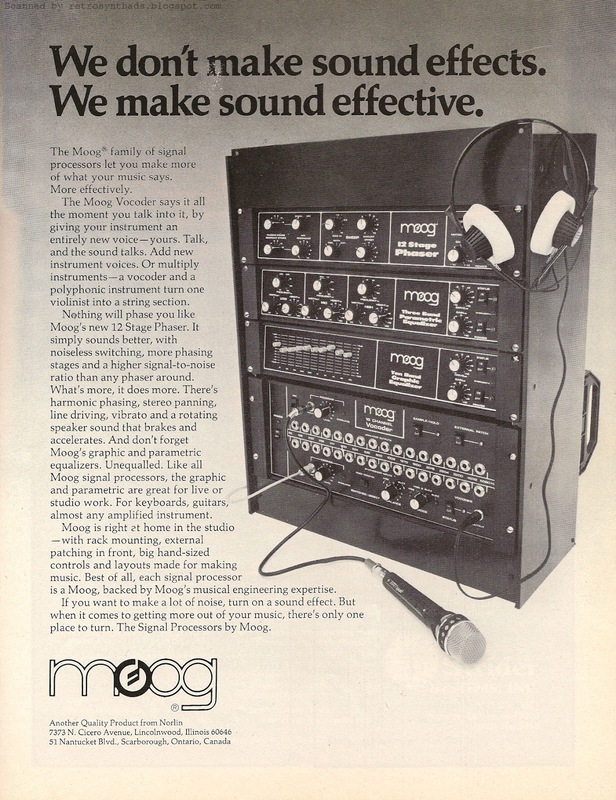 Of the four instruments featured in this advertisement - Moog 12 Stage Phaser, Moog Three Band Parametric Equalizer, Moog Ten Band Graphic Equalizer and Moog 16 Channel Vocoder - the two equalizers had already been featured in its own witty "All Equalizers are not Created Equal" advertisement. That equalizers advertisement ran between April 1978 and September 1978, and looking back now, one of the most interesting features in that ad is the branding - the Moog logo is accompanied by it's new "Signal Processors" friend. Comparing it to this ad that ran about a year later and only seems to have run once, and I notice that "Signal Processors" doesn't have its own little logo treatment any more. 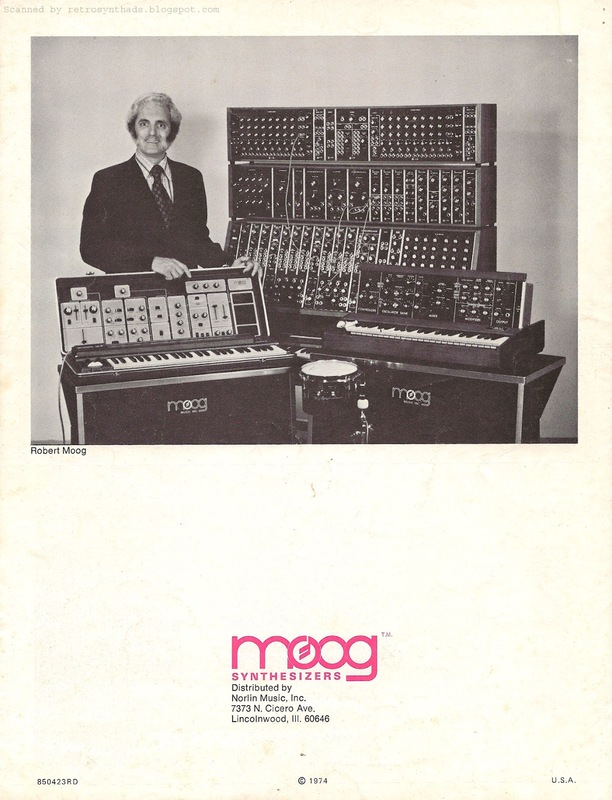 Now the Moog logo is all alone again, and in the ad copy the units are referred to as "The Signal Processors by Moog". Its a small change, but still interesting to ponder. The other two instruments in this advertisement are interesting as well. "Moog Phase Shifter. This phase shifter lets you choose the number of stages (up to 12) of phase shift you can have, in increments of two. The number of resonant stages is also selectable (up to 12). A mix control is provided for adjusting the amount of resonance you hear. You can also select whether you're hearing the phasing stages in series with themselves or mixed with the dry signal. An internal sweep oscillator is provided which can be linked with an external sweep oscillator or voltage pedal. The cutoff frequency can also be controlled from the front panel. A rotating speaker effect with a start and stop switch is supplied that can be controlled by a footswitch. A gain control is provided on the front panel, as are an on/off switch with accompanying LED indicator, an overload indicator, and a effect in/out switch with LED indicator. Moog, 2500 Walden Ave., Buffalo NY 14225." And then we get to the main course. The big gun. The Moog Vocoder. It may be at the bottom of the rack in the photo, but its mentioned first for good reason. It is... in a word... dreamy. I dream of adding one of those to my studio. If you had happened to be flipping around that same issue of Contemporary Keyboard you would have also found this small 1/16-page advertisement from Bode Sound Co.
Look familiar? It should. And sure enough, Google Moog Vocoder and chances are Bode's name will pop up as well. 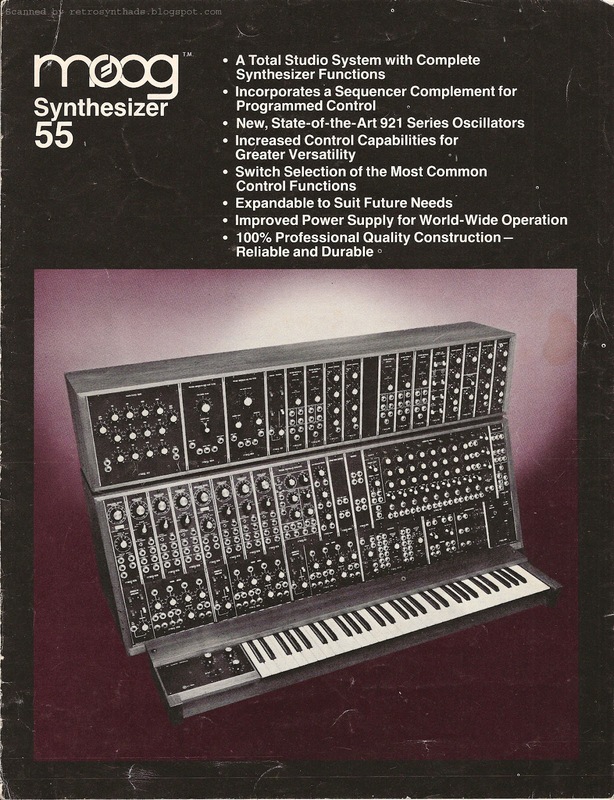 According to Vintage Synth Explorer's Moog Vocoder page, the Moog design is almost identical to the Bode vocoder. And you can see that in the images. Switch for switch, dial for dial. Pretty dang close. The Harald Bode page on Wikipedia provides a bit more information. 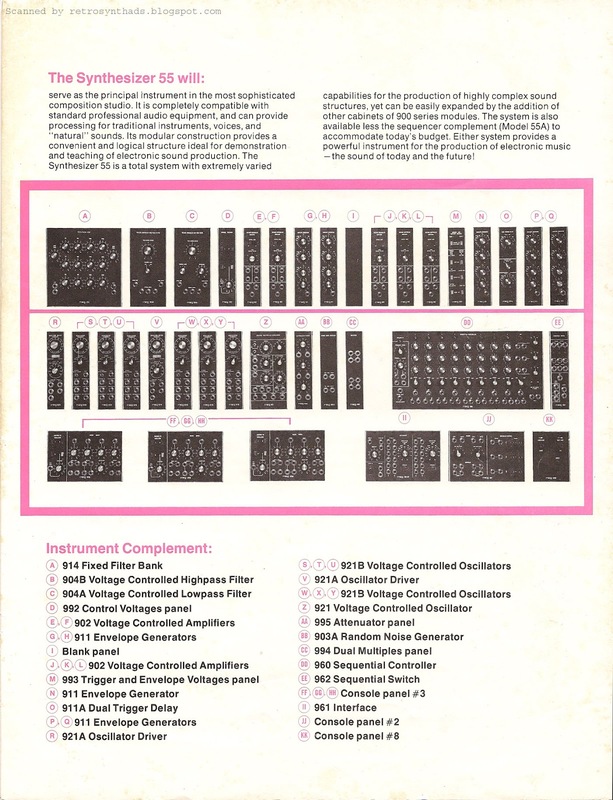 According to the page, the Bode Vocoder 7702, Bode Frequency Shifter and Bode Ring Modulator were "also licensed to Moog Music". I also found an August 2011 MATRIXSYNTH auction post for a Moog Vocoder with a good little write up on the it. 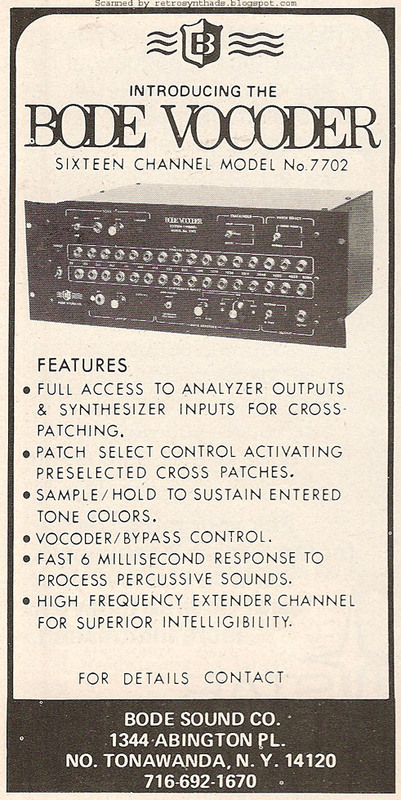 Scroll down the page and you will see a sell-sheet for the vocoder with that "Signal Processors" logo branding. But this time the logos are arranged using the "Signal Processors by Moog" format. A rather creative demo of what I think is that very vocoder can be found on YouTube. Definitely a handy device to have around for singing in key. Karaoke machine not included. 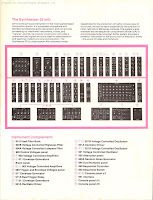 Moog Music Inc. "Moog Custom Engineering" 1/4-page black and white advertisement from the bottom half of page 46 in the June 1978 issue of Contemporary Keyboard. 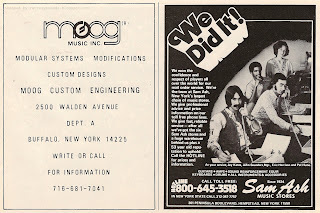 Originally I was only going to post the scan of the Moog Custom Engineering advertisement, but that Sam Ash ad sitting beside it also rawks so much and provides such a stark comparison to the Moog ad that I just had to include both. In no way should it take away from what I think was historically beginning to happen at Moog post Bob. I first started thinking about the rise in modding because I had pulled out and was flipping through the December 1977 issue of Contemporary Keyboard. Doing so brought up not one, but at least three references to two different companies that offered kits to modify Minimoogs. 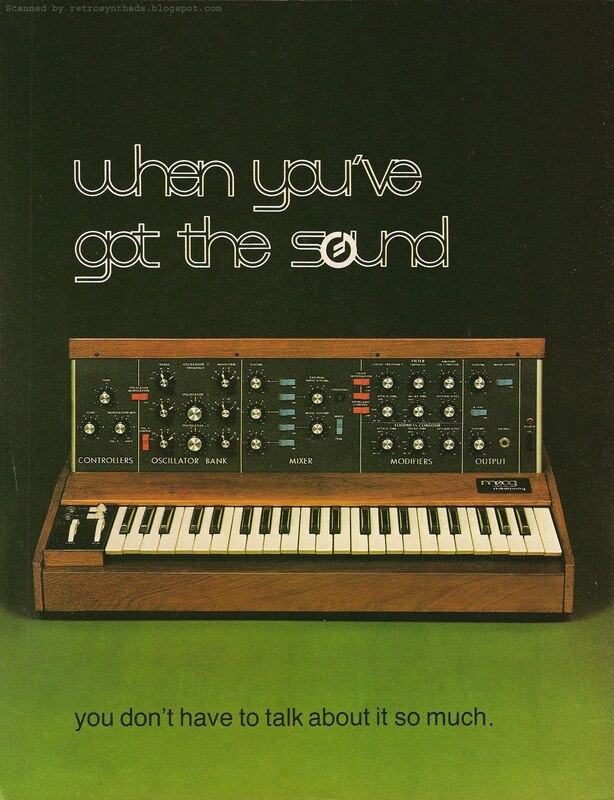 The first was in Dominic Milano's Questions section on page 61 - "What's involved in the Valley Sound second-voice kit for the Minimoog?" In his answer, he references John Glennon of Valley Sound, explaining that the second-voice circuit requires the installation of two circuit boards and a toggle switch that is installed on the lower left front panel of the Mini.Once installed, "with VCOs one and two on, if you press one key, both VCOs play that note. Holding a key down and pressing any key above the first key, VCO two plays the higher note. VCO three isn't affect at all and remains usable as a modulation oscillator. The second note depressed doesn't retrigger the envelope generators, and there is no second-voice memory." Interestingly, the kit won't work with "the original Moog oscillator board", explaining you could distinguish the original boards by the nine trim pots on them. Cost for the kit was $105.00 and would only take about an hour with a good soldering iron. The company would also replace Minis with the old oscillator board to one compatible with the kit for $100. Not a bad price, even in the 70s, eh? "Minimoog Modification. The stock Minimoog is a single trigger instrument. This modification changes it to a multiple-trigger instrument - new filter and volume envelopes are generated each time a note is depressed whether or not another note is depressed. 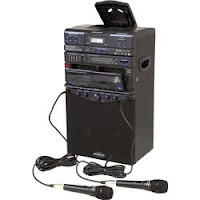 Price is $125.00 Professional Musicians Electronics. 2830-D De La Vina, Santa Barbara, CA 93101. "Anyone who works with electronic music in any way can't help but respect the Mini-Moog. Robert Moog and is concept of modular voltage controlled sound generation elements really threw the musical world for a loop. When acceptance of these "far out" gadgets came to the popular music market, it was primarily because of the development of the Mini-Moog." "Far out" is right. And right on! Anyways, after a bit more of an introduction, he gets down to business pointing out that there are a "great number of patch points in the circuitry where jacks could be added to facilitate future expansion or 're-patching' of the Mini's normalization scheme". In this first of what was to be a series of articles, he focuses on what he believed were the two "most needed and most useful expansion jacks" - Keyboard Control Voltage Output and Standard Gate/Trigger Input/Output. The article includes step by step instructions and photos. Not too shabby. Enough examples - my point being that it makes sense that with all these modifications going on, including Moog gear, that Moog itself would want to get in on the action. And so I think they did just that - pulling the Custom Engineering peeps out of the back room and giving them their own (albeit comparatively small) voice in advertisements. The ad itself is very minimal, very technical looking. Whether on purpose or not, it looks very... very... "engineering"-like. Now check out that Sam Ash advertisement beside it, with its variety of fonts, logos and general fun and creative layout. Looking at the two together is like looking at the brain itself - creativity on the right and logic on the left. 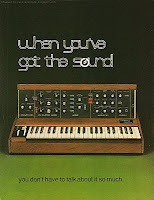 Some would say that Sam Ash ad might "drown out" the Moog ad. But for me, that Moog logo would be enough of a magnet, with that solid "o" in the logo would act like a bull's eye. 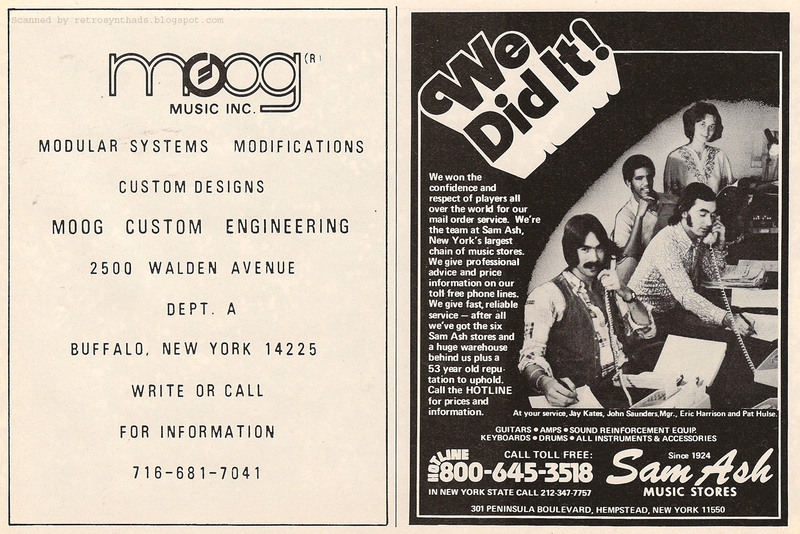 That Moog logo was (and still is) so synonymous with quality and the Moog sound that I would guess anyone thinking about dealing with Moog Custom Engineering after looking at this ad would have know exactly what they would be getting. Although I like to think of myself as pretty balanced between the creative and the logical, if I was being honest with myself I would have to say I lean more towards the logical. Yah, don't ask me to draw a dragon or anything. But if I recall, even someone as logical as Spock played an instrument, didn't he? 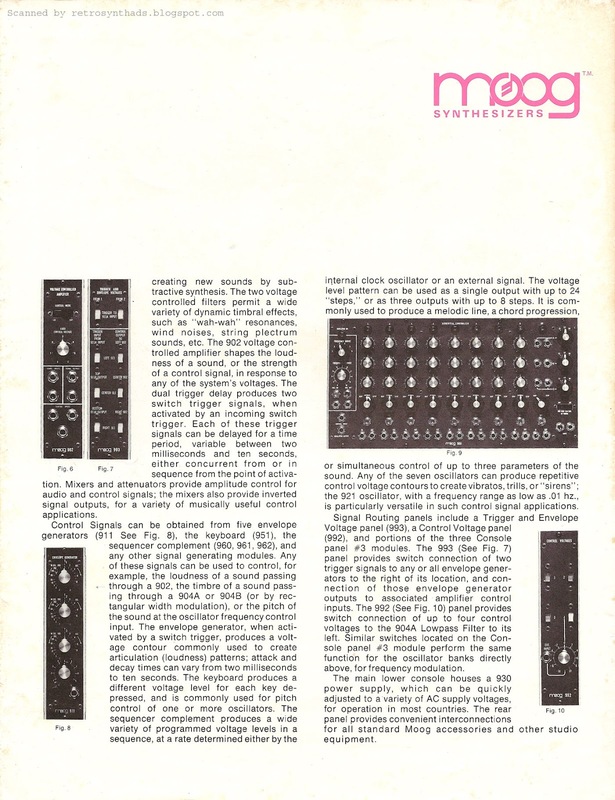 Moog Synthesizer 55 system six-page brochure, 1974. 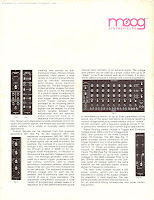 Moog Synthesizer 55 system six-page brochure from 1974. Okay - I know the order of this lovely brochure looks a little weird. I've reordered them a bit. The top row would actually be ordered differently if you unfolded the brochure and looked at it as one long page. But it just makes more sense to order them this way at the top of the blog post. The bottom row is laid out the same way the unfolded brochure would look. First and foremost - is that pink Moog logo adorable or what...?!? !Like seriously. I want to pinch that logo's cheeks. *Phew! * What a week so far! If you recall, on Monday I tried to get an early start on Bob Moog's birthday by posting this 1979 Happy Birthday message to Bob from Moog Music Inc. And I wasn't the only one getting an early start. Some amazing celebration activities and promotions were already going on both with Moog Music Inc and The Bob Moog Memorial Foundation. I was getting very excited to see what was to come throughout the week. By Wednesday, May 23 (yesterday when you read this) it was Bob Moog's actual birthday and celebrations were in full effect. I wasn't disappointed. The Google Doodle was probably the most amazing thing I came across. I first starting hearing about it the night before in synth forums from people in Australia and Japan who were in a much earlier time zone. But as soon as it hit Canada and the US, my Facebook feed and email box was filling up from non-synth-fanatics everywhere. Looking into cubicles at work watching people playing a virtual synth made me chuckle just a little. And made me wonder what would happen if I brought in my Minimoog or Moog modular one day. Two words - Gong Show. I was actually really surprised by how little action my 1979 Happy Birthday message post actually got on Monday and Tuesday. I was all smug when I posted it. But yah, nuthin' but a few Facebook likes and fairly normal traffic for a Monday post. But then on May 23 my blog, and probably all other synthesizer sites that featured anything Moogish, went crazy. Visitors to the site have more than tripled - and its not even dinner on May 23 as I write this. And page views are through the roof. I can at least partly thank MATRIXSYNTH for this spike. I was lucky enough to be his last afternoon post, which means... I GOT THE TOP SPOT ON HIS HOMEPAGE, BABY! At least for a while anyways. Unless you have a small synth blog and are as unhealthily fixated on Web analytics as I am, you probably have no idea what a difference a MATRIXSYNTH post makes. Even if it just for a few hours, it allows a large number of new visitors to find the blog, and also reminds the regulars that its blog post day. I'm also noticing an increased stream of traffic from the regular sources such as the Moog Music Web site (they include my scans and a link back to the blog), synthgear.com, and some of the forums out there (vintagesynth, KVR, even the Prince forum where friendly competitor Oberheim is tops). Also saw some new sites link to the blog, including Coudal.com. Warning... you *will* get lost on that site - very cool stuff. Okay - back to the brochure. I thought this was a fitting bookend to the Happy Birthday message post on Monday. 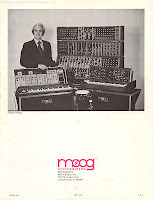 I originally planned on returning to Linn in my Thursday post, but I just couldn't leave Bob Moog's birthday yet. And I knew I needed to post something *BIG*. 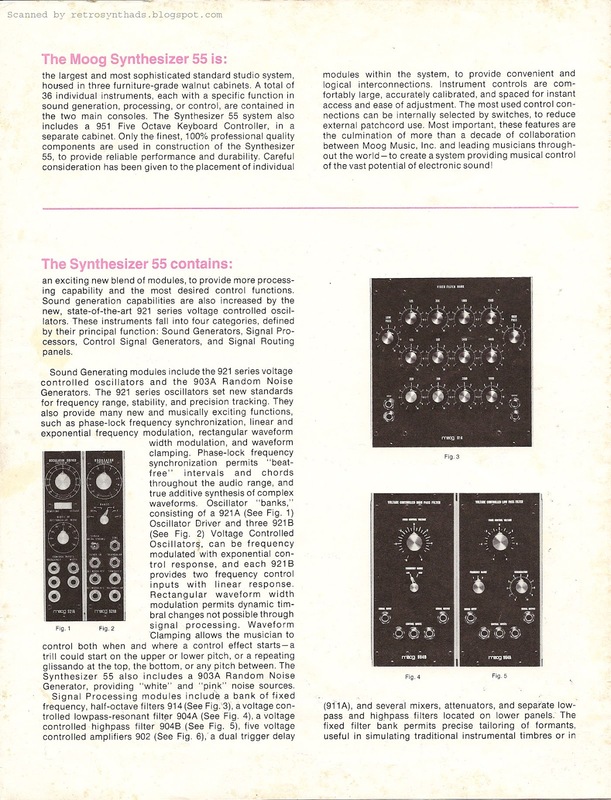 And, as the brochure states about the Synthesizer 55, this is "the largest and most sophisticated standard studio system...". I love this brochure. Its not in the best of shape, but I can't complain since it's about 38 years old. That's older than me (in my mind anyways). I suggest reading through this thing from beginning to end. The "inside" pages are lined up in the correct order (bottom row of images, left to right). And, don't forget that last page with the "instrument compliment" diagram. I drool every time I look at it. I've got a long way to go before mine reaches that size. 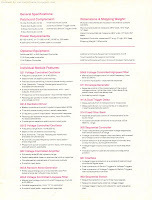 The general specifications page on the "outside" of the brochure is also interesting to read. 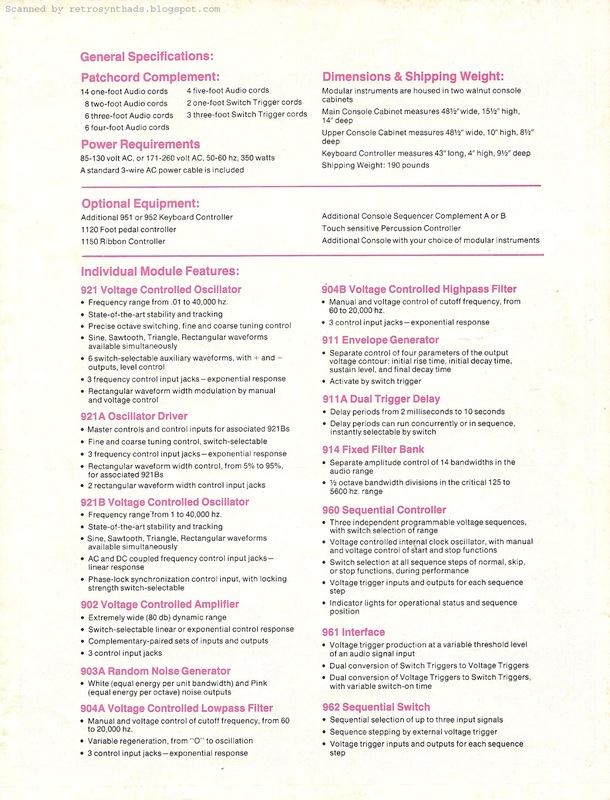 Lots of good historical reference information, such as the number of patch cords that came with the beast (answer: 43 - 38 audio cables ranging in length from 3-14 feet and five switch trigger cords), the optional equipment available, and even a summary of the individual modules' features. The more I look at it, the harder it is to put down. And so there you have it. Happy birthday Bob. And congratulations to Moog Music, the Moog Foundation, MATRIXSYNTH and anyone else that helped with the celebrations. Usually I knee-jerk to any type of communal celebratory hype. But not this time. I want to get even deeper next year. Is anyone else out there wondering how they are going to top this next year? Moog Music "Happy Birthday Bob Moog (May 23)" advertisement/message from page 65 in the June 1979 issue of Contemporary Keyboard. I thought I would get an early start on Bob Moog's birthday week by posting this sweet, sweeeeeeet and fun full-page find on the Monday prior to his b-day, but I'm already seeing other early celebrations starting to pop up. Excellent! For example, Moog Music Inc. appeared in my Facebook feed this morning with this awesome time-lapse of a mural painting on the side of the Moog factory. The Bob Moog Foundation's Web site also has a banner recognizing Bob's birthday suggesting you head down to the Early Girl Eatery where 20% of sales benefit the BMF. Looks yummy. And kinda makes me wish I lived near by. And I'm sure this is only just the beginning. Throughout the week I'll be watching Moog Music, the Moog Foundation, and of course, MATRIXSYNTH, for more fun and interesting celebrations. 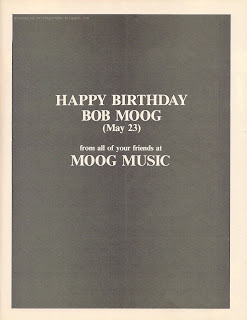 On the surface we have a nice friendly 1979 birthday message to Bob Moog from all his friends at Moog Music. Sure, no colour. Well, okay, in fact it looks a little dreary. Okay, okay - *a lot* dreary. But yah - definitely a simple, fun and positive message. Except that according to Wikipedia and a few other sources, Bob had left the company a year before. As much as I'm a glass-is-totally-full (half full with water, half full with air) optimist that believes that the words on the page were true feelings from those that had worked with Bob Moog and probably really missed his presence at the company, a teeny weeny tiny part of my gut was telling me that this advertisement could also have been a simple marketing attempt by Moog Music to keep Bob Moog's name personally associated with the company after he left. 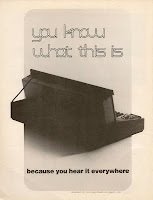 And interestingly, this rather stark ad actually appeared just prior to two of the more interesting (and favorite) Moog ads of all time - "You know what this is" from July 1979 and "When you've got the sound" from September 1979. In a lot of ways, this birthday ad/message actually fits in quite well this this bunch. So, just to be safe, I contacted Michelle to let her know I was going to post this little ditty during the Bob Moog birthday celebrations this week and she assured me it was fine. And, hey - who says good, fun, positive messages can't also play a role in good marketing anyways? Very similar words (and more!) have been used to describe Bob Moog himself. Linn Electronics Inc. "The best sound. The most features. The original." advertisement from page 41 in the April 1983 issue of Keyboard Magazine. 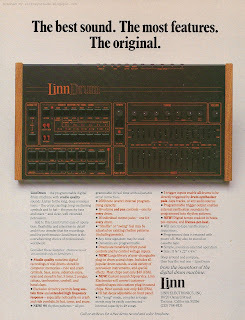 Linn Electronics stepped up the "complication factor" for Keyboard readers when they replaced their long-running LinnDrum introductory advertisement with this more copy-heavy ad that ran from April - September 1983. There is really three different messages going on in the ad-copy - in my opinion, two more than there should be. First, we have the regular LinnDrum sell-job - promotional introductory ad-copy in black. Second, "features in red are available only on the LinnDum"
And third, a few bullet items labeled "New!" - apparently both software updates and accessories. When you dig through it all, I think the one real message Linn is trying to get across is finally listed at the end of the ad-copy: "Shop around and compare, then buy the real one - Linn Drum". In other words - look at our features and compare us to the competition. That would have been much simpler and more effective. No need for colour coding and bold "New!" labels. Also, I just have to point out that although most "new" features are in red (ie. available only on the LinnDrum), there is one that is black. This seems to indicate that the one black "new" feature was available on other drum machines before the LinnDrum? If true, I'm not sure you want to be promoting that kind of thing, even in a round-a-bout kind of way. But full points to Linn Electronics for honesty. "New! 98 rhythm patterns - all programmable in real time with adjustable error correction"
"49 rhythm patterns - all programmable in real time with adjustable error correction"
Because I'm about to hopefully score one, I naturally became curious about what other revisions and updates were added over time to the LinnDrum. With instruments like the Prophet-5 or Arp Oddysey, you can't take two search-steps around the Internet without tripping over specifications on the different versions - increased patch storage, change in internal or external design, etc... everyone and their mother is trying to tell you everything they know. But I found it extremely difficult to find anything out about changes made to the LinnDrum. According to the Wikipedia page for the LinnDrum, it was manufactured for over four years and sold over 5000 units. Surely the competitive landscape changed enough over time that Linn had to update the thing. But yet, every site I seem to visit has the exact same information. Using the example above about the change in the number of rhythm patterns available, online references like Vintage Synth Explorer's LinnDrum page seem to always quote the availability of 98 patterns - 56 user patterns and 42 preset patterns that can't be re-recorded). No one ever seems to talk about the 49 patterns that were originally available. But obviously there must have been updates like the increase in rhythm patterns or the other new feature promoted in this ad (in red) - "New! Digital tempo readout in beats-per-minute, and frames-per-beat". Even though I'm pouting, I did find some evidence of other updates too - online and offline. For example - online, I found that Forat.com's LinnDrum page has a LinnDrum Rev 3.1 update available for a respectable $60 as well as a 3.1 Software Manual for download (scroll down to the bottom) dated early 1984 that states "The following describe additional operating capability undocumented in copies of the owner's manual prior to 2/1/84". "Its newly updated memory has a capacity of 5200 events in ninety-eight patterns and forty-nine songs." Before I sign-off - three other features of this ad that caught my eye. First is that the suggested retail price, found in the introductory ad at $2995 is now gone. And newer references to the price I've found online (and in that Electronic Drums book) has the price at $2495. Obviously the LinnDrum had a price drop somewhere. Pre-intro ad: "Designed for non-technical musicians"
Intro ad: "Requires no technical knowledge"
And now in this ad: "Simple, musician-oriented operation"
I think we have a winner! Much better. Third - right at the bottom of the ad is the promo for the free demo record that was also included in the last ad. But this time - it also includes the colour brochure! I included a recording of that sound sheet in my last blog post. And that post also included a link to an eBay auction for the brochure and sound sheet. Check it out if you are interested. 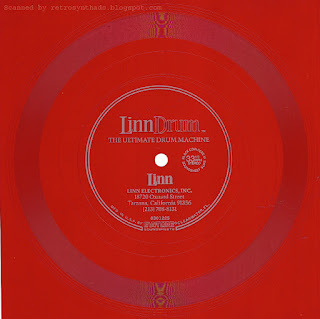 Linn Electronics Inc LinnDrum "Ultimate Drum Machine" demo record from 1983. What a nice lookin' rekkid! Actually... what a nice lookin' sound sheet - all floppy and red and stuff. 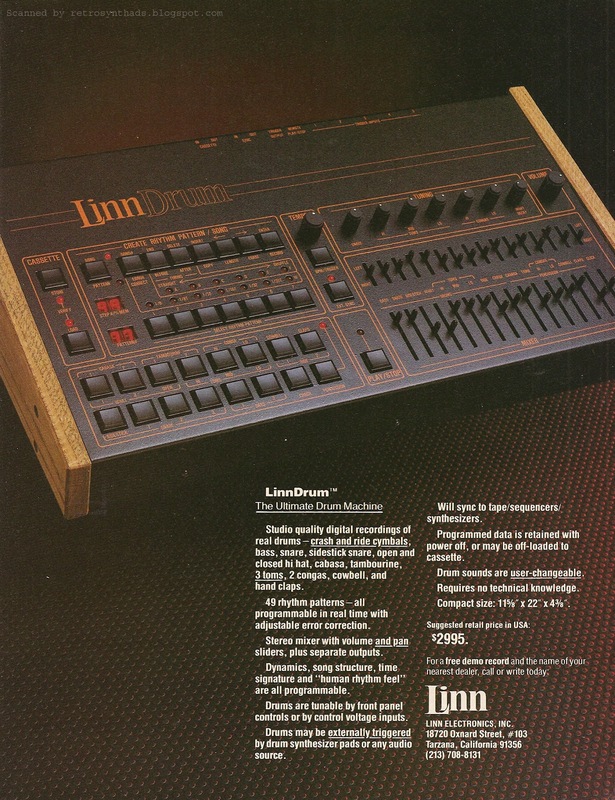 This two minute and 22 second demo was part 2 of Linn Electronic's 1982/83 LinnDrum advertising campaign titled "The Ultimate Drum Machine". The campaign included an ad of the same title that appeared in Keyboard Magazine (and maybe others - haven't researched that too widely) that ran from May 1982 to March 1983. And in that ad was a promo offer to get a free demo record along with the name of the nearest dealer. Later, it looks like a brochure was also on offer. Unfortunately, I don't have it. I could get it right now on eBay, along with another copy of the record - but for a hefty $149.99 price tag. That's just too steep for me. It does look gorgeous though. There is one small potential problem. According to the code on my record - 830122s it looks like this record was probably pressed on January 22, 1983. That date is well after the actual date that the ad and promo offer started. So, either they did more than one pressing (do you "press" a sound sheet?!?!) of the same demo OR could it be that the demo was changed during the promo offer. Looking around the Web quickly I couldn't find any other examples of the demo - so can't be certain. But, I'm pretty sure it would have been another pressing of the same music demo. Just a hunch. I've uploaded a copy of the demo to SoundCloud. Now, please remember - this is one of those flexible sound sheets - so the quality is about the same as my mom would find on one of my 45s of Mighty Mouse when I was a kid. (hint: a little scratched up). But, it does provide a nice window into Linn's expectations of use of the drum machine by musicians. I'm actually quite impressed by the number "listens" my other SoundCloud demos have received. It was kind of an experiment to get me to start using SoundCloud. I'm really digging SoundCloud's HTML5 option. I'm still hoping to update my Advertising Timelines to HTML5 so they can be viewed on the iPod and iPad. 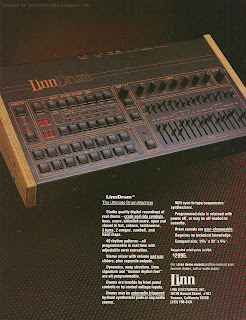 Linn Electronics Inc. LinnDrum "Ultimate Drum Machine" advertisement from page 27 in the May 1982 issue of Keyboard magazine. I'm on a bit of a vacation. From life. And so far its going swimmingly well. But, that also means the word count is probably going to fall a little short for the next few posts while I enjoy life with a chainsaw and a beer. What...? Huh...? Put the what down...? Can't hear you...! 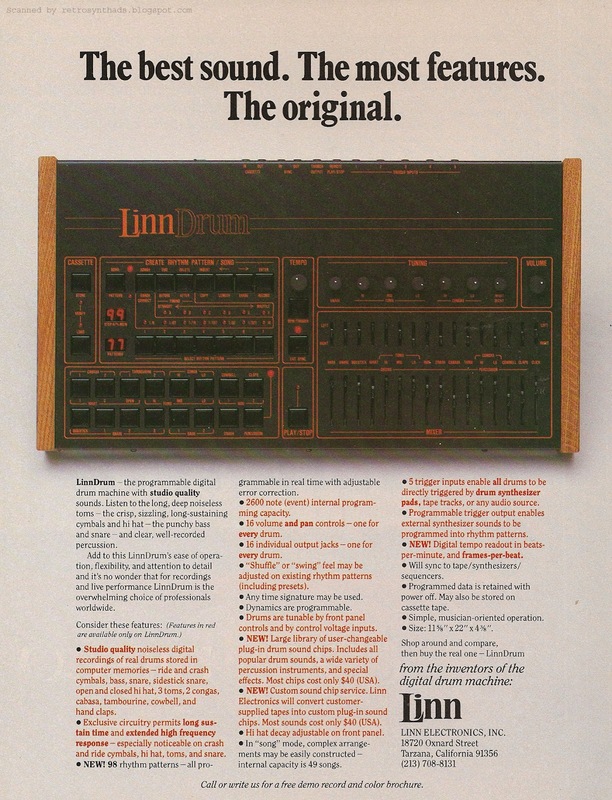 For some reason, when I recently saw an auction for a LinnDrum, this ad was one of the few LinnDrum ads that I could visualize without looking back through magazines. I'm sure that's partly because it ran for a relatively long period of time in Keyboard during a very influential period in my life - almost a year starting in May 1982 and ending in March 1983. The first LinnDrum advertisement appeared a month earlier was a bit of a teaser. It was only black and white, and the photo of the instrument was small and grainy. But I was drawn to the simplicity of that original ad then, and am still drawn to it now. If you read through that original ad, you would know it was really just a precursor to this ad. A warning shot across the bow - to readers and other companies in the drum machine game. "Coming next month from the inventors of the digital drum machine"
And true to their words... the following month... BAM! What a difference a month makes! Readers set their eyes on this full-colour beauty with its lovely photo of a shiny new LinnDrum all up-close and personal. Wood grain sides and all. So close-up that readers could even make out the control labels on the instrument. Yum. But Linn did change that last little bit of wording at the end. Did you catch it? This intro ad: "Requires no technical knowledge"
It's also good to see that the suggested retail price didn't change within that one month - still $2995. There is one other bit of new info at the end of the ad-copy. Free demo record! And I love demo records. But that's enough for now. Time to get back to beer drinking and chainsawing. 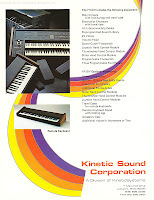 Kinetic Sound Corporation Prism digital synthesizer 4-page brochure from 1981. Errr.... let me rephrase that. Should joysticks be located above or below modulation wheels? When I first took a closer look at this brochure I thought this was one of the same questions facing Kinetic Sound Corp when they were designing the Prism synthesizer. The two photos of the Prism on the front and back pages of the brochure have the joystick logically located above the wheels. But the inside photo has the joystick located awkwardly below the wheels. I say "awkwardly" because I would think that if that big-@ss joystick was located at the bottom of the controls, it could possibly get in the way when trying to control the wheel during your screechy modulation-heavy solo dedicated to all the young ladies in the audience. Most synthesizers dodged the joystick/wheel issue (and added expense) by only including one or the other on the left-side control panel - DON'T get me started on which is "better". And in those cases where a synth did include both, usually it was because the joystick was also playing a programming role - such as with synths sporting vector synthesis, like the Kawai K1 and the Korg Wavestation. In both cases one or both controls were moved out of the left-side panel for easier accessibility. But with the Prism both the joystick and wheels are on the left-side. And that big fat silver joystick controller would definitely be in the way. Then I thought - since only two (and 2/3rds) Prisms were made, maybe the company figured this problem out after the first one was built and changed the configuration for the final production model. Although, then I would have expected them to spend the small amount of extra cash on new photos to keep everything consistent in the brochure. Otherwise the inconsistency could just get confusing for readers of the brochure. 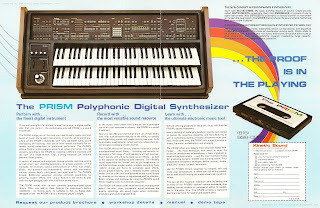 "Pedals, footswitches, sliders, joysticks, an thumbwheels comprise the PRISM's basic manual devices. Each of these devices can be physically located to complement your style of playing." So, the physical location of each controller (thumbwheels, joysticks, sliders) would have been up to the user, and the photos could have been showcasing this "feature". Huh. Apart from the potential inconsistency and confusion that could result from the photos, this brochure is awesome, with more than a couple of other features that are worth pointing out. 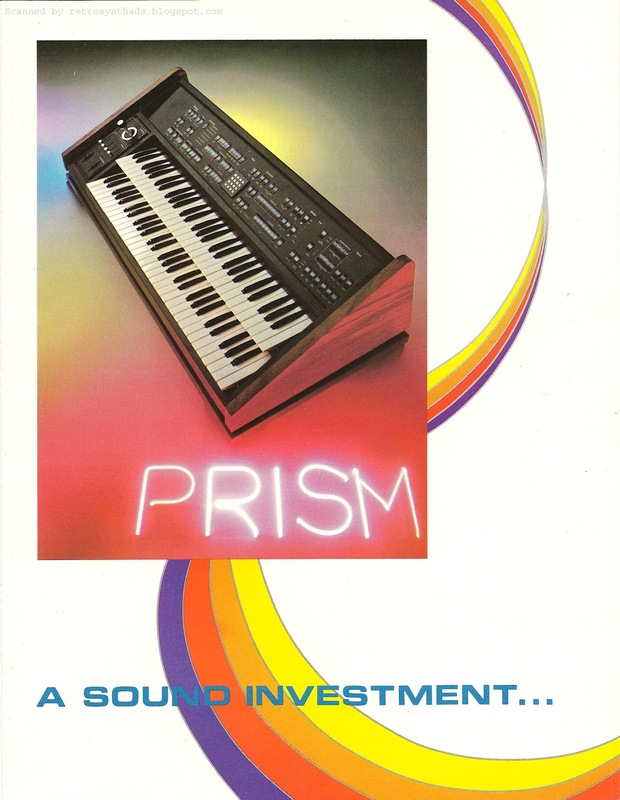 For example - the rainbow/spectrum theme found in the original advertisement's title (the word "PRISM" in a number of colours) was obviously carried over to this brochure through a colourful ribbon design that runs through all the pages - front, inside and back. A reader may casually notice the rainbow graphics on each separate page when looking at the actual physical brochure, but its not until you see all four pages at the same time (such as is laid out in this blog post) that the connection it helps build between the pages really leap out of the subconscious. Also - I just gotta mention that huge image of the cassette and the tag-line "the proof is in the playing". That same tagline was also included in the original intro advertisement in Keyboard and referred to the workshops that were being promoted. But in this brochure there is another option. If you really just wanted to hear the $30,000+ beast, an interested reader could spend a measly two bucks and order a demo cassette! While doing research I came across an MP3 file of an excerpt from a Prism demo in a 2006 post on MATRIXSYNTH (click on the title link to hear the MP3). The file's original owner - Elhardt - has a rather colourful past with what MATRIXSYNTH described in 2005 as "the biggest hoax in synth history", and so you can see from both MATRIXSYNTH's and a commentor's initial reaction, there was originally some skepticism to the MP3 files authenticity. But even Elhardt responds in the comment section to vouch for it's authenticity. 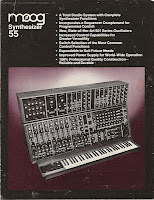 Definitely follow the links if you want to read more about the synth hoax. 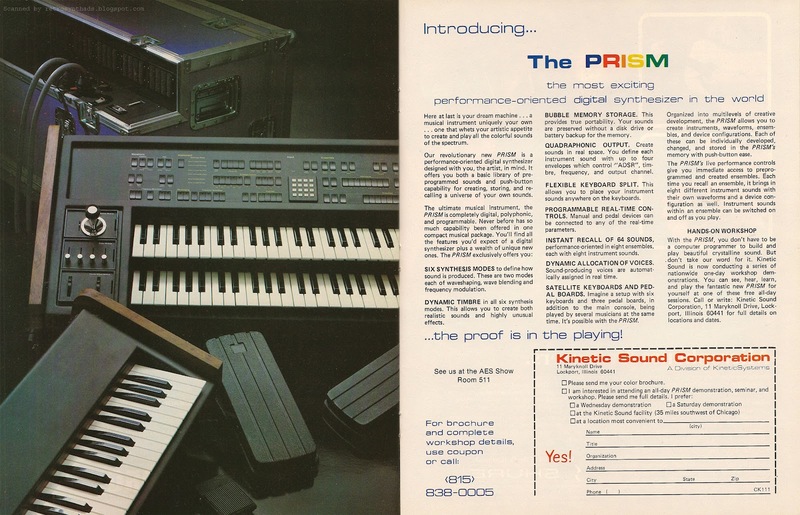 Kinetic Sound Corporation Prism performance-oriented digital synthesizer 2-page introductory advertisement from page 16 and 17 in the October 1981 issue of Keyboard Magazine. A rare ad for a really rare synth. Although the ad appeared less than a handful of times in Keyboard, I'm sure those that saw it never really forgot it thanks to the fact that it was a colourful two-page spread with a unique rainbow-inspired ad-title. With over half the ad devoted to a photo of the machine and its accessories, my eyes totally ignored the ad-copy at first, immediately drifting from the colourful ad-title to the photo - and in particular that rather big shiny joystick on the Prism that screams "touch me". Its not too hard to figure out what that anvil case is - if you look closely there's a power switch and unused cable connectors with it. Also - there are what looks like cooling vents on the case as well. I'm thinking a power supply for the instrument and the satellite keyboards. But it makes me wonder if it had other functions as well. As I've mentioned in the past, often when I come across a big photo of an instrument in an ad, my first gut instinct is to look for a logo on the machine, but unfortunately one isn't visible in this ad. My first thought is "opportunity missed" since there is a nice empty space just above the joystick on the front panel. 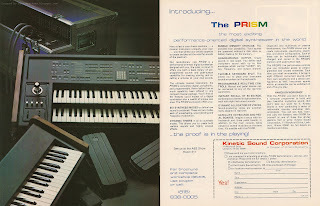 But, one quick Google search later and I come across a photo of a Prism on synthony.com's Prism page, and wouldn't you know it - what was empty space in this photo suddenly has 18 or 20 buttons. So, it looks like the Prism in the ad is definitely an early model. Not that "early" really has meaning when it comes to the Prism. According to Mark Vail's book Vintage Synthesizers, only two were built. And, out of the two, only one was ever sold. And the instrument that was sold... it was yanked back by Kinetic Sound Corp when it looked like the owner "wouldn't be in the synthesizer business for long". 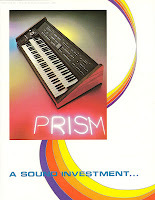 The full write up from the book contains some excellent historical and operational information about the Prism and parent company Kinetic Sound, and I found a full excerpt from the book, copied with permission, on synthmuseum.com's Prism page. Speaking of Prism Web pages, one of the most comprehensive sites for this instrument on the Web has to be kineticjim.com's official unofficial Prism page. Kinetic Jim enthusiastically includes a wealth of information including history, specs, design, panel control layout and functionality, optional accessories and anything else you can imagine. With most of the facts apparently obtained and/or verified by former Kinetic Sound Corporation president Jim Stephenson! We are talking *a lot* of the information I have not seen elsewhere online. For example, the site confirms that, in fact, three units were built, but the third was still "awaiting final testing" before the Prism project was abandoned. Bam! That's the kind of great info I'm talking about! That empty space above the joystick in the ad photo - taken up by18-20 buttons in the photo on synthony's site? That's an eight-track, 8000 note sequencer! And that big box behind the instrument in the ad with the cables connected to it. I was right - that is the electronics enclosure with "two main console connectors and two connectors for expanding to another electronics enclosure". And it also contains the "four audio output jacks [that] are controlled by the quad switch-matrix section". Nice. But back to the ad for a second. Although I ignored the ad-copy at first, I just couldn't stay away for too long. There is just so much of it. In-your-face themes that keeps popping up in the ad is "performance" and "live performance controls". And they encouraged musicians, in two ways, to find out more about these aspects. The first was through hands-on workshops. With such an expensive instrument, and with only two built, musicians with a heavy wallet had to do a little bit of work to hear one - make an appointment. This was probably also a good way to weed out those that were just window shopping. The workshops appear to have included both predetermined dates as well as possible future dates (Wednesdays and Saturdays preferred). You could also get a demo at the Kinetic Sound Facility located 35 miles southwest of Chicago. The second way musicians could learn more was through a free colour brochure. Did someone say "free"?!?!? !